RAPID PATCH | Pro Chem, Inc. 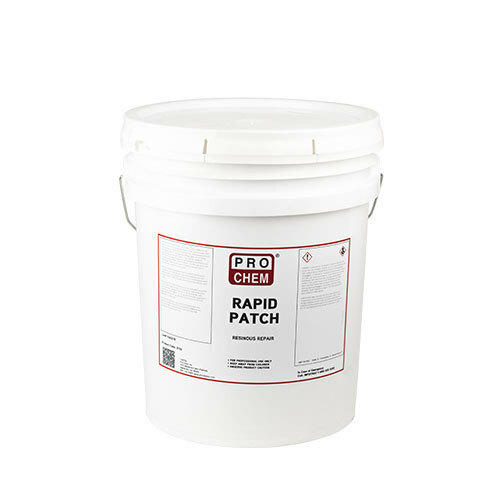 RAPID PATCH is a high-solids, three-component, all-weather, non-shrinking hybrid concrete repair and patching material. It utilizes epoxy/urethane technology along with specially graded aggregates for achieving rapid turnaround concrete repairs. This product is specifically formulated, designed and engineered for use as an interior/exterior concrete spall and crack patching and repair mortar where time is critical or cold conditions are a concern. Perfect for anyone that needs to repair concrete. This solution is even better than most because of its rapid set time, high strength and resistance to cold temperatures. Surface Preparation: RAPID PATCH is moisture sensitive and should not be applied to wet surfaces. New concrete must be a minimum of 28 days old and dry at the time of installation. Clean the area of all debris and contaminants; oil, grease, dust, dirt, unsound concrete etc. Expose clean, roughened concrete for best results. Cut or chip a vertical edge, minimum ½ in. deep, around perimeter of the area to be patched. Make sure the area is clean, dry and sound. Sandblasting may be necessary to expose clean concrete. Vacuum or blow off concrete dust and debris with oil-free compressed air. Mixing: For temperatures below 10°F, kit contents should be preconditioned to 65°F – 85°F. Have all components and tools ready and patch area properly prepared prior to mixing/placement. Mixing container, tools and patch area must be clean and dry prior to use. Mix only as much RAPID PATCH as can be used within the pot life of the material, approximately 3-5 minutes at room temperature. Stir/shake each component A & B for 30 seconds. Mix components A & B together for 30 seconds. Add component C aggregate and mix for an additional 30 seconds until all of the aggregate is wetted out. PLACE IMMEDIATELY. MIXING LESS THAN FULL KIT QUANTITIES: Shake component B for 30 seconds. Mix equal parts (1:1 ratio) of components A and B vigorously for 30 seconds. Add 3 parts by volume of component C to 1 part mixed A & B components and stir for 30 seconds until aggregate is wetted out. PLACE IMMEDIATELY. Placement: Pour and place the RAPID PATCH immediately after mixing. Use a clean steel trowel to force the RAPID PATCH down into the repair area and then to strike off the top surface to match the surrounding concrete. Steel trowels may be slicked off using xylene to add a degree of lubricity to troweling and clean off the trowel surface. After reaching set in about 20 minutes, the RAPID PATCH may be ground flat and level with the surrounding concrete using a flexible 7 in. grinding wheel to grind smooth and level with the finished grade. RAPID PATCH may also be shaped by scraping or cutting with a razor knife scraper before reaching full set. CLEAN UP: Clean tools with xylene or acetone before the material has set. Excess Part A and Part B material should be mixed together and allowed to reach hard set, then discarded in the hardened form.